For someone to stand on one leg for a long time is not so easy, but someone else can do this for hours. To balance one’s body, one has to learn the secrets of doing so. One needs to master the art of body discipline. The monks of Shaolin Buddhist Sanctuary have to undergo such martial arts in Hainan province of China and also learn the spiritual lessons of Buddhism. 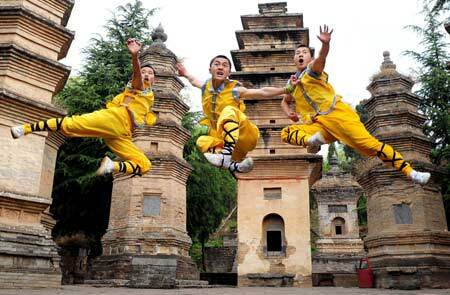 These monks of Shaolin Buddism after learning martial art demonstrate them in public on the stages. They attain the perfection after many years of six hourly non stop daily practice. So far only two of them in the world can balance their body on just two fingers, that is on one index finger of each hand. The monks call this as “two fingers GENIST kung-fu”. One monk named Si Xingsong(19) is one of the two monks who can complete this feat. While performing Shaolin Kung-fu, a worst disaster can take place is when the bones of fingers break. These monks live on the Mount Song in the Hainan province of China. They arise at 4 Am daily and practice the Kung-fu art for 6 hours non stop. After this routine, they study the scriptures of Buddism for six hours non-stop. Their Martial arts practice and spiritual awakening sessions videos are popular on the Video sharing sights. Underneath given is a link to see the most daring and perfect demonstration of fingertip balancing strength. This tradition is age-old and is still being kept alive in the interior China.